In a competitive business landscape, having a strong, positive online presence is a virtue for a business. A Retail Dive survey found that more than two-thirds of consumers search online before actually buying a product. In such a scenario, a business cannot risk having negative publicity. Therefore, online reputation management has turned into a necessity for businesses of all sizes today. Reviews are important criteria among customers to judge the quality of services or products offered by a brand. A BrightLocal study found that nearly 3 in 4 customers prefer to buy from a local business that has positive online reviews. While a brand cannot actually control the reviews its customers post online, it can certainly make the effort of acknowledging both positive and negative reviews. This shows that your business cares for a customer’s appreciation, and takes their feedback seriously enough to make improvements in your products and service. Leaving reviews unanswered can make customers feel that their opinion doesn’t matter to you, turning them away. 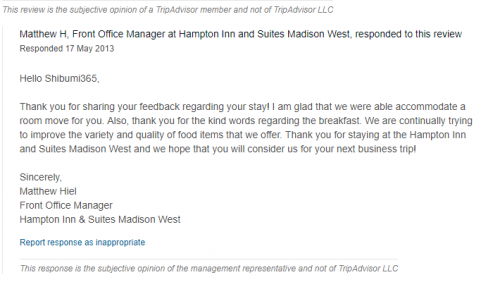 For instance, Matthew Heil, Office Manager at Hampton Inn & Suites, Madison West found a positive review from a customer on TripAdvisor. Instead of a standard reply, Matthew chose to add a personal touch by addressing the reviewer by name, thanking them profusely, and reiterating why the hotel is a great place to stay. Respond to all types of reviews (positive, negative and neutral). Add a personalized touch while responding. Reinstate your point and try to add value to your response. In a socially proactive digital world, ignoring social media can significantly harm your prospects of having a positive online reputation. Though social media is one of the most promising platforms for businesses to interact with customers, Clutch’s 2017 Small Business Social Media Survey found that 24% of small businesses do not use social media at all even today! Further, only 41% of businesses that use social media do so multiple times a day. Not having an active social media presence can hamper a business’ growth prospects in the digital world. When consumers look for a brand online, they expect to know more about it through its Facebook Page or interactions on Twitter. A poor social media presence portrays a brand’s apathy that it need not interact or engage its customers. A lot of small businesses make the mistake of abandoning social networks after a few weeks of activity. The impact – a big turn-off for potential customers who go online looking for information about the brand. Post regularly at times when your customers are most active online. Try to engage customers by starting conversations. Identify friendly brands and try establishing mutually-benefitting liaisons. A website serves as an online storefront for a business. It follows that a website, just like the store’s façade should be attractive, meaningful and have the potential to draw customers in. Web copy is what does that. Poorly-written copy makes the customer wary of a business, its capabilities, and its seriousness. When visitors do not find something engaging on the website, they have no problem finding the door. This, on the top of degrading your web rankings (indirectly), results in lost sales opportunities. Don’t write copy like this. 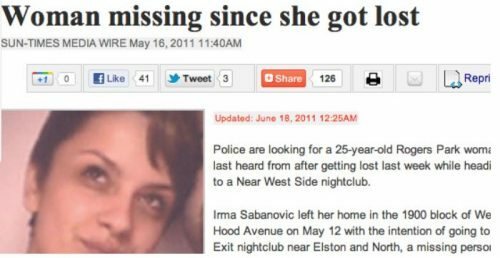 Keep your end-customers in mind while drafting website copy. Focus on what difference your product/service can make in your customers’ lives, instead of harping on features and specifications. Provide value to the reader by giving her something to take away or act on once she leaves your website. Your employees serve as digital spokespeople for you. Whatever they do and say online is construed as the word of the brand. Your prospective customers might come across your employees’ online profiles, actions, or writings, and associate these with your brand’s philosophy. If customers find a difference in what a brand promises and the behavior of its own employees, they’ll not trust it at all. Even if your employees aren’t posting conflicting stuff, but they simply don’t show brand loyalty themselves, it might raise a negative flag in your audience’s mind. Motivate employees to become your biggest brand ambassadors. Create employee profiles on your website and ask them to share these on their personal social media pages. Just like a negative review, negative PR has a direct impact on the reputation of a brand. If potential customers come across an article that portrays your brand in poor light, they’ll instantly reverse their decision to do business with you. Therefore, you should keep a close eye on what is being said about your brand online. This is not too difficult – tools like Google Alerts help you stay aware about latest posts on review sites, blogs or publications. Ignoring negative coverage by major publications in your industry can prove disastrous to your brand’s online reputation. For example, Samsung, one of the leaders in mobile and electronic gadgets has borne the brunt of negative online coverage from time to time. 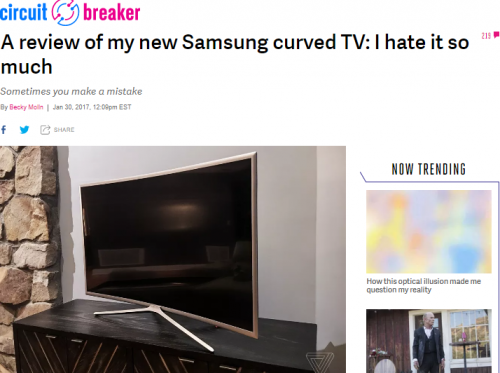 The Verge ran a very unfavorable review for Samsung’s curved TV soon after its launch, which likely had a negative impact on sales. Dilute the impact of bad reviews by improving your product and working with influencers to promote your brand. Contact review posting websites, blogs and publications, offer more information, and request them to re-evaluate their take on your product. Never be rash or rude in justifying yourself. Having a positive online reputation is the first step towards a strong digital footprint. If you really want to improve how your brand is perceived by your customers, make sure that you work hard to avoid the mistakes we discussed here at all times. Good luck! Jaydip Parikh is the founder of Tej SolPro. 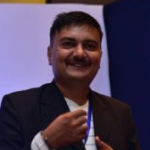 Jaydip has more than 15 years of experience in the field of sales and digital marketing. He has taken lectures on various topics of digital marketing at numerous renowned institutes. He regularly speaks at various conferences and events, both online and offline. He is known as Jaydip Baba in the digital marketing industry. You can follow him @jaydipparikh or connect with him on Facebook. Yes, thanks for posting these. Basically, I guess one of the main points that most people might not understand is that having no or very minimal online presence leads to problems as well.